Children and teachers from six of our Science for Life schools came to Gillespie to take part in a series of gesture-controlled musical glove workshops! These workshops were organised for the first week of October to celebrate Ada Lovelace Day, a yearly event set up to help raise the profile of women in STEM. The workshop was an opportunity for children to learn about coding, how it is useful to musicians, and to meet a STEM professional (and woman) who uses coding to create wonderful musical inventions! Helen Leigh, an inventor who has worked with musicians such as Ariana Grande and Imogen Heap to develop the gesture-controlled musical gloves, led the workshop. Helen took us through the process of sewing felt gloves, then coding Micro:bits (a tiny programmable computer), which fit into the gloves, so that they played different sounds according to how they moved. 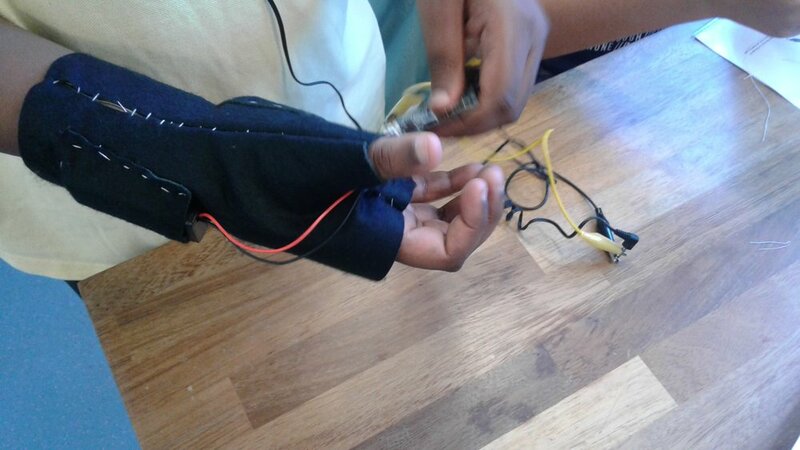 As soon as children had made their gloves and learnt how to code the Micro:bits, they had some time to create their own code and explore the possibilities of their invention! Meeting a scientist/inventor was very inspirational. It was also really nice for the general well-being of those children to be given an opportunity they would probably never have outside school and be part of such a small group chosen to take part. The children who attended also came back to school raving about what they had done so I had lots of other children coming to me and asking all about it. A couple of the children I brought with me were children who often display challenging behaviour. I was so pleased to see them engaged and focussed on the tasks they were given. Listening carefully, following instructions and being resilient when things were difficult. When we arrived back at school, both their parents and teachers were taken aback at how enthusiastic and engaged they had been. All the teachers who attended were eager to follow up in school, for instance by planning for the children to share their learning with their Digital Leaders and Computing Leads. As a result of the success of these workshops, we will look into other projects and workshops that use MicroBits - for instance, Helen informed us that they can be used to create remote controlled robots… Watch this space!